-The highest odds of each line is the winning score of the player. -The player's winning score is calculated from the left of each betting line. -The total score of each game is calculated by player's betting amount multiplied odds on each lines. -Bonus games include: Free Spins, The Secret Box Bonus Round, Send Her A Gift Bonus Round. -Following elements can be replaced, it comes with alternative to replace and complete the winning combinations, but excluding Scatter Symbol and Wild Symbol. -The first reel out of 5 will not appear Wild Symbol. 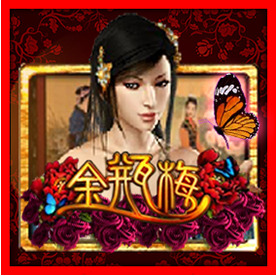 -Wu Da Lang has 5 gift available for Pan Jin Lien; where, game starts when window opens. Click gift and Wu Da Lang will give it to Pan Jin Lien by the window with his two hands; the real man value will be upgraded and obtain bonus when every time Pan Jin Lien feels happy about it once; the consecutive 5 time of successes will turn Wu Da Lang into a real man and bring beauty home. -There are 7 jewelry boxes available on the long table in room; each with previous value. Open each jewelry box one by one until the multiplication appears, the total value of the jewelry boxes multiplied it is the total bonus as obtained. Bonus symbol 3: 3 out of 5 reels appear(Free spins): Enter into the free Game of 5 times. -Pon Chuen Mai holding Pipa will appear; and each time she plays the instrument shall give a free game once. As long as 3 or more matched on any one point scattered on 5 reels will be awarded bonus amount. Phiên bản © 2019 EGCity Bản quyền (hoặc quyền sở hữu tác giả).